TECH LINE makes a full range of power enhancing and protective coatings for internal engine parts. Some coatings are available to the “do-it-yourselfer” but most are being applied by hundreds of professional coating shops worldwide, giving everyone the opportunity to benefit from these advanced technologies. Combines the durability of a ceramic resin with the lubricity of a ceramic lubricant. C-Lube is a thermally cured Dry Film Lubricant designed to provide high pressure lubrication to surfaces subject to sliding, rotating or oscillating motion such as piston skirts and gears. The coating is also designed to aid in the more even transfer of heat, reducing hot spots. C-Lube applies in a thin film that allows the coating to be burnished to a film less than .0003” in thickness, allowing extremely tight clearances to be utilized. It may be pre-burnished prior to installation/assembly of a part or will burnish during operation. C-Lube contains special lubricating ceramic fillers increasing the wear resistance and lubricity of the coating. The low 350°F cure temperature allows for the coating to be used on a variety of substrates. C-Lube may be used on both wet and non wetted surfaces. C-Lube is a water based material that contains no hazardous solvents. Main & Rod Bearings Coated with C-Lube Dry Film Lubricant. Maintains adhesion at base metal temperatures in excess of 1500°F. Creates a hard, semi-rigid, ceramic-like finish that survives impact, as well as expansion and contraction without separating from the base metal. Lubricating pigments are capable of carrying loads in excess of 350,000 PSI. Resistant to most chemicals and acids while inhibiting oxidation. Water based, no hazardous fumes, non flammable. Unique water based system that fully cures at 350°F for one hour. Material cleans up easily before curing with water. Non flammable system with no V.O.C.’s (volatile organic compounds) is compatible with today’s emphasis on environmentally friendly products. C-Lube may be used on all metals except magnesium. Part #CCL available in Quart & Gallon. Available to professional applicators only. Combustion chamber coating for all metals. Keeps heat in combustion chamber longer through the power stroke. Blurs hot spots. Reduces the potential for detonation. Highly resistant to thermal shock. Survives cyclic heating and cooling. Note: use CBX (below) if using nitrous oxide, supercharged, or turbo charged. Part #CBC-1 available in 3-Ounce (retail packaging), Quart & Gallon. Requires oven curing at 350°F for 1 hour. Part #CBC-2 available in 3-Ounce, Quart & Gallon. Available to professional applicators only. Thermal barrier coating designed for performance engines running: 12.5:1 compression ratios, nitrous oxide (N2O), supercharged or turbocharged. For all other applications use CBC2 (above). Creates a hard surface specifically designed for engines running high volumes of fuel and/or high compression ratios, or closed chamber heads. Keeps heat in combustion chamber longer through the power stroke. Blurs hot spots. Reduces the potential for detonation. Increase torque, horsepower and combustion chamber efficiency. Part #CBX available in 3-Ounce & Quart. Available to professional applicators only. Reduces friction, galling and scuffing. Requires no clearance changes to compensate for the coating. Can be burnished with scrubbing pad, if necessary. Apply to any part subject to sliding or rotating friction. Excellent for use on bearings, piston skirts, etc. Water based, no hazardous fumes, easy cleanup. Part #DFL-1 available in 7-Ounce (retail packaging), Quart & Gallon. Solvent based, can be sprayed in very thin films. Requires no clearance changes to compensate for coating. Part #TLML available in Quart & Gallon. For professional applicators only. High load durable thin film lubricant. Primarily used to build up piston skirts. Used in very high RPM engines or where very long rods are run. Top coat with either TLML or PKSX. Part #TLMB available in Quart & Gallon. For professional applicators only. Designed to treat surfaces that either cannot be coated with a liquid lubricant or for parts that cannot be oven-cured. Load carrying capabilities in excess of 350,000 p.s.i. Bonds at 20-millionths-of-an-inch thick. Requires no clearance changes. Functional lubrication up to 1500°F. Can be applied over dry film lubricants. Fluid retaining, compatible with petroleum-based and synthetic oils. Designed for cylinder walls, lifter bores and valve guides. Extreme temperature and pressure lubricant. Can be cleaned/removed with solvents such as alcohol. Part #PKSX available in 1-ounce & 8-ounce bottles. Retail packaging. More evenly distributes heat over a coated surface. Aids in cooling heat sensitive parts. Enhances cooling through improved heat transfer to oil and other coolants. Excellent for intake manifolds, brake components, oil pans, carburetors, radiators, etc. Resistant to most chemicals, including acids. Thin Film (typical at .001″); Black in color. Part #TLTD available in Quart & Gallon. For professional applicators only. Designed for the interior dimension (ID) of chrome pipes to reduce bluing. Excellent thermal barrier for exhaust ports. Diesel pistons coated with Piston Top Gold (TL-PTG) and C-Lube Dry Film Lubricant on the skirts. Originally developed for top fuel drag racing engines. May be used on any combustion chamber surface in any type of engine. 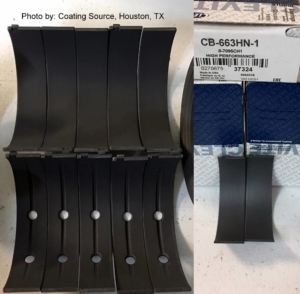 Reduces heat penetration on coated parts. Evenly distributes heat, reduces hot spots, aids in flame travel and combustion. Reduces the amount of heat the incoming air/fuel mix absorbs, thereby reducing the potential for detonation. Sheds carbon, reduces carbon buildup. Part #TL-PTG available in Quart & Gallon. For professional applicators only.